Sited in a quiet location, in a quiet cul de sac with no passing traffic. Ideal for children. Close to the pedestrian gate, short walk to the complex and beach. There is also a free train to take you around the park. Fully double glazed, blown air heating in both bedrooms, gas fire in the living room, and heated towel rail in shower room. Ensuite to master bedroom. Living room with wrap around seating area, large flatscreen TV with freeview, dining table with stools, and pull out sofa bed. 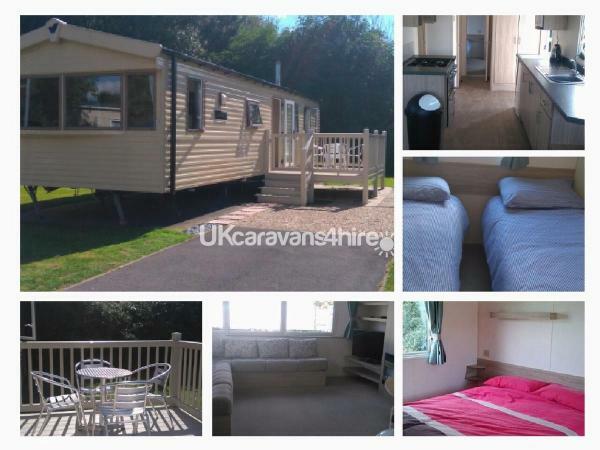 Fully equipped kitchen with cooker, microwave, fridge freezer and pots, pans and utensils. Twin bedroom with two single beds and wardrobe. Master bedroom with double bed, two wardrobes, and chest of drawers. Ensuite with toilet and wash basin.